I’ve just completed my third week at salesforce.com and I wanted to share with you the light and colors of this amazing on-boarding. My first day already had a special flavor. What would a geek like me do when arriving in the lobby? Foursquare it! And as I’ve included the @salesforce handle in my message that of course got spanned on Twitter, LinkedIn and Facebook among others – I’m becoming lazy and all my accounts are chained- the salesforce team back in the Bay Area using Radian 6 spotted me within minutes as a new hire. What a surprise when I got a response message on Twitter from the official @salesforce feed stating “Welcome to the family”. I felt it as a social hug if you will, a good first impression of a social enterprise. This very first day I could feel the energy, passion, commitment and team spirit of this fast growing company individuals. If you were not aware, Salesforce has been to date the B2B software vendor to reach the $2B mark the fastest. It was not Microsoft, Oracle nor SAP. Combined with the think different kind of attitude and this desire to show the world that cloud computing is a must for all enterprises, Salesforce employees seem all to be part of a burning quest: Born Cloud, Reborn Social. Another clue that I have been joining a cloud company, I could finally behave at work just as I had been in my day to day life: everything on the cloud – my music, my videos, my books, my address book, my email, my calendar, my files from multiple devices, my bank accounts… The ultimate mobility lies in this, just give me a connected device and I can operate within minutes just from everywhere. Computing has truly become a utility, plug and live! Salesforce.com is walking the talk. Good to feel. As a matter of fact I was totally able to operate with the corporate environment at the end of the very first day, using a Mac at work, my personal iPhone certified and even a request for me to buy an iPad for work. What a difference from any other company I was given to work for before. I’ve been meeting a lot of people at salesforce since this first day and I can attest there is a true company’s culture by which we all live by. Someone summarized one aspect of it with this quote “Type A people environment where A.H. cannot survive”. I believe such a company is due to succeed big time because of the people. I’ve been given to compete against very large companies before and I know it: a small gang of passionate and committed individuals with strong beliefs and a quest at heart can make a huge difference. As usual, Mary Meeker delivered this presentation during Web 2.0 summit and summarizes important trends in our industry with a lot of meaningful data. Authentic Identity – The Good / Bad / Ugly. But Mostly Good? USA Inc. – Pay Attention! Actualité : baromètre BVA/Syntec pour 01Business&Technologies. EMMANUEL OBADIA, Senior Vice President Enterprise Products chez Sage. Coup de pouce à une start up : Jérôme Valette, directeur général de aEnergis, une start up qui optimise la collecte des déchets grâce à un système de capteurs radio. Back in the 80’s, ERP software have been created in order to address a key productivity issue in the enterprise. The goal, as it is still the case today, was to reduce transaction costs in automating key business processes from manufacturing through finance and sales organizations. The notion of transaction cost was introduced back in the 30’s by a brilliant British economist by the name of Ronald Coase in his essay The Nature of the Firm in 1937 to explain why the economy is populated by a number of business firms, instead of consisting exclusively of a multitude of independent, self-employed people who contract with one another. It is an even more interesting approach knowing that this research occurred just after the big depression period, to be remembered as we have been going through an impressive downturn just now. A transaction cost can be defined as a cost incurred in making an economic exchange. For example, most people, when buying or selling a stock, must pay a commission to their broker; that commission is a transaction cost of doing the stock deal. Or consider the evolution of transacting with your bank. Back a few decades ago, you would have to go to the branch office for any operations like deposit a check, getting cash… This induced for the bank to maintain branch offices and full-time employees managing these interactions. The cost of every transaction with its customers was in the $10 range average. Over time, the banking industry leveraged telephone based interactions, ATMs and of course internet banking to take that transaction cost significantly down, let’s say a few cents. At the same time, customer satisfaction went up as the transaction can take place at any time 24/7, from anywhere and customers are driving the transaction themselves. As the success of ERPs went on and businesses understood the value of automating key business processes with “off-the-shelf” enterprise application software instead of writing one from scratch, their appetite for more automation, more users involved and lower transaction costs, increased. The advent of the web and its ability to connect totally different IT systems seamlessly over the cloud, with e-mail to start with then web services, offered an opportunity to ERP vendors to expand the ERP scope to other part of the organization such as sales force automation (CRM), supply chain operations (SCM, SRM) and product life cycle management (PLM). It also did pave the way to connect remote users to the ERP via thin clients or ERP client in a browser to be more precise. This was the second generation ERP, in which a lot of ERP vendors are still in, allowing for users of the extended enterprise (suppliers, resellers, customers…) to participate in key business processes thus lowering even further transaction costs. As a result, all of the ERP vendors did a pretty good job to automate all transactional business processes such as order-to-cash, service fulfillment and supply chain execution. As a matter of fact, employees are now focusing on managing exceptions and pursuing business opportunities which are highly collaborative or information driven activities, devoting minimal time to transactional business processes. This is good for the enterprise and ERPs are thriving on this. Digital Natives or Generation Y, referring to individuals born between the mid 70’s and early 90’s, will outnumber baby boomers in the enterprise in 2010. 96% of them already joined a social network online and they will be the managers of our businesses within the next 10 years. They are all about these new technologies to conduct both their personal life as well as their professional one, which reinforces the need to accommodate them when we think about ERPs and more generally the new generation of enterprise applications. 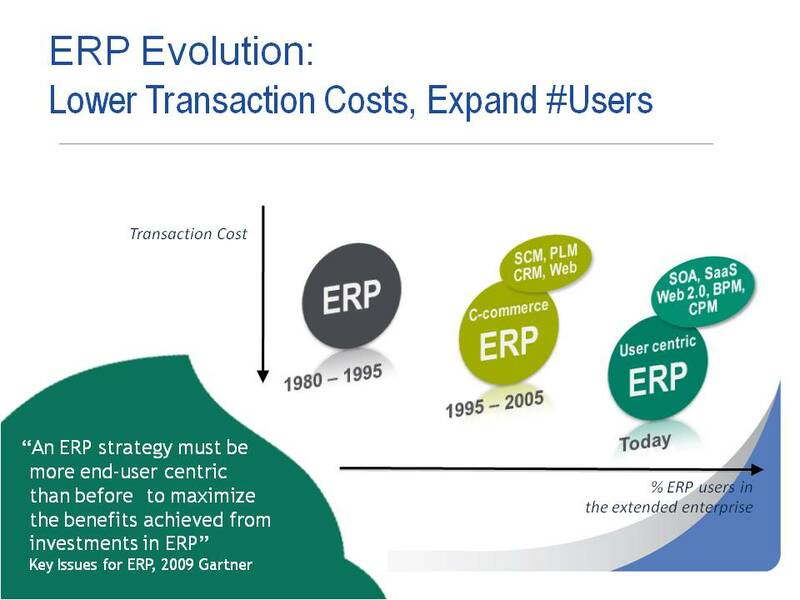 As we combine the appetite to lower transaction cost, encompassing collaborative business processes, as well as re-engage with all users of the extended enterprise and accept that individuals are more educated and better equipped at home than in the office when it gets down to information technologies, ERPs need to reinvent itself one more time. ERPs must be thought from the user out, it must be user-centric and re-engage with all stakeholders in the enterprise or it will become legacy. Modernizing ERPs towards 3rd generation ERPs, as described earlier, is a must to reach new levels of productivity, agility and effectiveness in the extended enterprise. The recent evolution of our globalized and highly competitive economy, the acceleration of change and the ubiquity of information will allow for no choice but for enterprises to embrace these new trends or disappear. Now is a good time to replace legacy business management software, as most companies did that move back 7 to 10 years ago with Y2K, the Euro introduction or US GAAP, IFRS or Sarbane Oxley regulations. Emerging economies should take advantage of their relative low technology adoption to leap frog this information era revolution and appear as highly competitive businesses. The wired economy we’re living in now is a massive opportunity. I will obviously only highlight the point 2. which wouldn’t have been on the list a few month ago. I remember being looked at as a strange animal when pitching about Marketing 2.0 back in 2007. I heard many things as “this is just a fad”, “you’re always trying to bring up something new”, “Our customers are not 15 years old”, etc. In the marketing area, social media and Web 2.0 importance is raising under this economic downturn period we’re in, more rapidly I anticipate than if the business was going to grow. I’m expecting Cloud Computing and new software subscription business models to come up more rapidly in the IT space for the exact same reason. The economic downturn is an incredible opportunity to reconsider what we’ve been doing so far, to challenge deeply our fundamentals, to stress decisions that were not that urgent otherwise. A good thing in my views though of course I suffer just as everyone out there of this downturn (mood downturn as well by the way). My take would be for you, already a blog reader ;-), to start your day in the office tomorrow by deciding to integrate in one of your planned campaigns a Marketing 2.0 technique. Try to pick the one that is intuitively the most relevant to your audience (start a blog or a podcast, foster a community or integrate an existing one, turn a major topic of interest into a wiki for and by your customers, start a twitter micro-blog for one of your offer) and do not forget about including video material as we discussed earlier this month. “Mapping content to the sales funnel “ is an immensely important aspect of success in lead nurturing for the complex sale. It deserves to be among the top priorities because some of the others – Web 2.0, social media and traditional content – are at their most effective when mapped to the sales cycle. Marketing 2.0 will make it big in 2009. 2009 IT Trends: can community based IT services on the cloud help? As 2009 sets itself to unfold, major IT trends are starting to shape our future. It’s going to be tough and only those who can go beyond their fears and control it will be able to seize opportunities in front of us. Yes IT will be impacted, but what is a better time to make the tough decisions you’ve been reluctant to make? I found it very interesting that in this context the eTask.it initiative, referred to by a friend of mine part of the management team there. In a nutshell, they describe themselves as “the first IT collaborative system” addressing IT staffing via community enabled sourcing. Cloud Computing can also deliver Service as a Service, kind of funny, or maybe more appropriately Service on the Cloud as an important part of the Cloud Computing trend. Good luck to them. More than yesterday, lesser than tomorrow, bet on the Web 2.0 for your future.